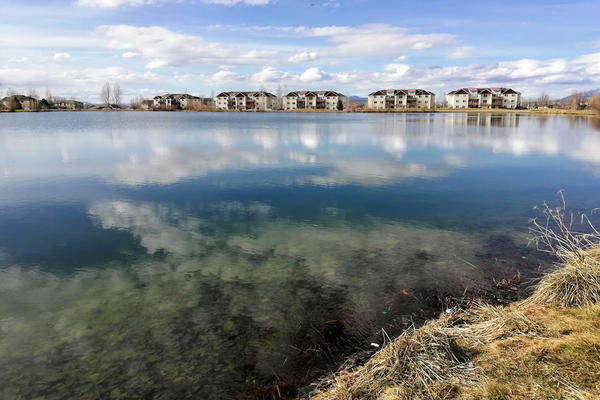 River Rock Pond sits in the middle of a subdivision southwest of Belgrade, April 2019. Montana Fish, Wildlife and Parks is proposing to remove non-native smallmouth bass from Gallatin Valley ponds. The agency says the Midwestern fish could spread to other water bodies — including the blue-ribbon lower Madison River — and drastically reduce trout populations. In an office decorated with elk antlers and a stuffed turkey, Travis Horton, FWP’s Regional Fisheries Manager for southwestern Montana, gathers up a thick stack of public comments. It’s just a few hours before his presentation on the proposed project to remove smallmouth bass. “A lot of folks really like smallmouth bass. They’re really fun to catch. I agree. I think they’re a really fun species to catch, but that doesn’t mean they should be everywhere,” says Horton. Smallmouth bass are not native to Montana. They thrive in rivers and prey on juvenile trout and whitefish. While it’s illegal to transport or relocate any live fish in Montana, that certainly hasn’t stopped people before. In the Flathead, there have been 600 documented illegal introductions of bass, bluegill, perch, and crappies. FWP released a proposal in March to poison smallmouth bass in Gallatin Valley ponds and restock them with rainbow trout. The agency found smallmouth in a pond in the River Rock Subdivision southwest of Belgrade and suspect they’re in two private ponds. FWP is worried smallmouth could spread to the lower Madison River and from there, on to the Gallatin, East Gallatin, Jefferson and Upper Missouri rivers, threatening ecosystems and economies. Anglers generated over $900 million in the state last year according to the FWP 2019 Report to the Montana Legislature. "People don’t come to Montana from all over the globe to fish for smallmouth bass," says Horton. "They come to fish for trout." The public comment period on FWP’s environmental assessment closes Wednesday at 5 PM. It includes four alternative plans. One is no action. The other three propose killing smallmouth through a chemical treatment, overfishing or manually removing them with nets and electroshocking. In their preferred plan, FWP would kill the fish with rotenone, a naturally-occuring chemical derived from the roots of certain tropical plants. Some indigenous groups in South America have used rotenone for centuries to harvest fish, and it has been used in Montana since the 1930s. At low dosages, rotenone passes through an organism’s gills into the bloodstream and prevents cells from taking in oxygen. The chemical compound breaks down naturally as it is exposed to oxygen and sunlight. Horton says a lot of people have asked why they can’t get rid of a species by fishing for them. “Fishing to the decimation of a fish population — nobody will put the effort in long enough. And when the catch rates really decline, there’s still fish out there that will spawn and come back. Not to mention you have to get all sizes of them so the juveniles that aren’t able to be caught, are in there and have to grow to a catchable size,” Horton says. He says manually removing fish — especially smallmouth bass — would be pretty difficult. They’re good at avoiding nets, and electrofishing doesn’t kill fish below a five-foot depth. Those tactics wouldn’t work at River Rock Pond, which has a surface area of about eight acres, and it’s maximum depth is about 25 feet. “It’s not if, it’s when people move these things, and I guarantee there’s already people thinking about getting in there now to move those fish so I don’t have time to wait for another two or three years to wait for another alternative,” says Horton. Several hours later in a subdivision southwest of Belgrade, kids on scooters, dog walkers and a Girl Scout troop circle River Rock Pond. About a dozen people have gathered in the community center to learn about FWP’s smallmouth bass removal project and ask questions. Several of the attendees share they enjoy fishing for smallmouth bass and oppose the removal plan. Nate Jenkin, a junior at Belgrade High School, says he’s fished at River Rock Pond for 12 years. He tells Travis Horton he doesn’t see the smallmouth in this pond as a threat to trout fisheries. "If somebody’s driven enough, they’re going to end up there," says Jenkin. "It’s not going to be out of this pond, it’s going to be out of Canyon Ferry. It’s going to be out of Horseshoe Lake; it’s going to be out of Flathead Lake so to say that the state can’t support ..."
Horton says he would be willing to kill off the smallmouth bass and restock the pond with with non-native largemouth bass. He views it as a compromise since largemouth pose less of a threat to the trout populations. Buddy Drake is a retired fisheries consultant and a resident north of Belgrade. He supports FWP’s proposed plan. “I am concerned about the transportation — bucket biology or ecoterrorism is the new phrase — and it’s a matter of trying to make sure we don’t have a source here that will help populate the rivers where people come to fish,” says Drake. But Roger Koopman who serves on the Public Service Commission in Bozeman shares a different perspective. “Often times, frankly it’s better to just leave things alone. I mean sometimes we over-manage, I think. And you end up trying to fix one problem and creates another and another and a lot of unintended consequences,” says Koopman. Comments on the FWP proposal must be received by Wednesday at 5:00 PM. They can be submitted online or mailed to: Montana Fish, Wildlife & Parks, c/o Smallmouth Bass Removal, 1400 S. 19th Ave. Bozeman, MT 59718; or email FWPRG3EA@mt.gov. Correction: An earlier version of this story erroneously called the Belgrade subdivision Red Rock. It was updated to River Rock Subdivision April 18, 2019. Glacier National Park released an environmental assessment Friday for a proposal to kill off non-native fish in a remote area. Biologists say that could help fortify native species against the threats of climate change, invasive species and habitat loss. State and tribal agencies are opening up mandatory watercraft inspection stations this week. They’re preparing for the influx of spring and summer boaters from near and far. Watercraft inspections are used to prevent aquatic invasive species, like quagga and zebra mussels, from spreading into Montana's lakes and streams. State legislators are considering requiring mandatory decontamination for wakeboarding boats, and having boat owners pay for the procedure. House Bill 608 would establish a $50 fee for boats with ballasts or bladders to undergo a mandatory decontamination each time they enter the state or cross the Continental Divide into the Columbia River basin.